Bela Lugosi stars in this feature-length version of his first serial! The Empire Transport Corporation is at the mercy of “The Whispering Shadow”, a criminal mastermind who uses radio signals to control a ring of saboteurs out to destroy the company. After his brother is killed in one of the attacks, reporter Jack Foster joins forces with renowned detective Robert Raymond to capture the elusive gang leader. Clues point to the owner of a bizarre wax museum, Professor Strang, who is obsessed with getting his hands on a priceless set of jewels hidden in the Empire warehouse. Raymond and Foster encounter collapsing walls, car chases, explosions and other breathtaking obstacles in their quest to uncover the Shadow’s identity and end his reign of terror once and for all. 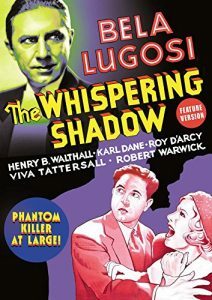 For his role in The Whispering Shadow, Bela Lugosi was paid $10,000, the highest salary of his career. Filmmakers Colbert Clark and Albert Herman purposefully emulated Karl Freud’s cinematography in Dracula (1931) to emphasize Lugosi’s presence. This would be the final film for silent screen star Karl Dane, who had appeared in several box-office smashes, including The Big Parade (1925) and The Son of the Sheik (1926). MGM had terminated his contract in 1930, citing his heavy Danish accent. Unable to find steady work afterwards, Dane committed suicide a year after The Whispering Shadow’s release.